So, I have this kid. He just turned 14! I know, I know, I can’t believe I am old enough to have a 14 year old either! Anyway, this kid is pretty great. He is doing pretty good in school, he finished his first year of school football (versus youth club football) where he started all year, and he helps out with little kiddos at church. He has a ton of friends and goes out of his way to find a place for everyone that he meets. He is just a really, really nice boy, and I couldn’t be more proud of him. Except for this one thing. 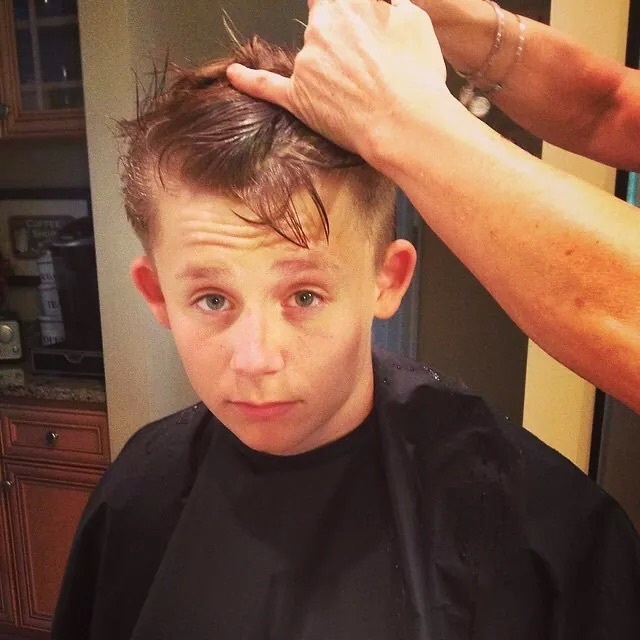 This itsy, bitsy, little, tiny thing…he has absolutely no desire to do anything with his hair! It is driving me CRAZY! I have offered bribes. I have threatened to take things away. I have told him horror stories about kids with long hair and football helmets (okay, they were made-up stories, but still). I even pulled out the mom-card! You know the “I’m the mom thats why” card. I am fighting a losing battle. The last time scissors touched his head…it was May!!! This whole parenting thing has opened my eyes to the way God must feel when He sees me doing some of the things I do. Like, He just shakes his head knowing that eventually I’ll find my way. That, sooner or later I’ll realize the freedom that comes with complete surrender to Him. He is the truth that shines through the dark no matter how far I wander. No matter how long I am gone. It doesn’t matter how lost I think I am, His truth always brings me back. Jaden, used to run up to me with his arms open wide, and hands up in the air saying, “You! You!” whenever he needed to be held. Whenever he needed ME. It didn’t matter if I was in another room; he would find me. It didn’t matter how long I was away from him; he always ran. When he found me and I picked him up, he would look at me with these huge blue eyes and say “I YOVE you, Mommy, I YOVE you much!” It didn’t matter where he was, or how long it had been since he last ran to me; I caught him every time. P. S. Take a minute (okay, maybe 4 1/2 minutes) and listen to Forever Reign by Hillsong…it paints of perfect picture of the love and acceptance we receive when we run to His arms! You can listen to it by clicking here.